'Nothing's agreed until EVERYTHING'S agreed!' PM savages EU's £50bn UPFRONT divorce bill. THERESA MAY took aim at European leaders insisting Britain would not pay a Brexit divorce bill upfront, as the EU has demanded. 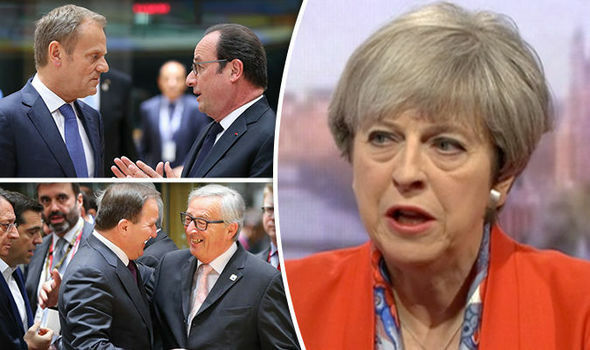 The Prime Minister claimed the UK will not pay the EU the Brexit divorce bill until the end of negotiations with the bloc. European leaders agreed in unison on Saturday at a summit that the UK should pay the Brexit divorce bill upfront, before a trade deal is negotiated. Speaking on The Andrew Marr Show, the Prime Minister rejected the claim that Britain would be forced to pay a divorce bill to the bloc upfront. She said: “What they are very clear about is yes they do want to start some discussions about money. “I’m very clear that at the start of the negotiations we have to be very clear not just about the Brexit arrangement, the exit, how we withdraw, but also what our future relationship is going to be. Marr quizzed the Prime Minister, asking whether she would be “prepared to agree on the money” before anything else is agreed. As Marr pushed for a clear answer, Mrs May rejected the notion the UK would agree the Brexit divorce bill first. She said: “No, if you look at what is being said in the guidelines, they say that they want to start the discussions on a number of issues. “There are things that we absolutely agree on, which should be early in those discussions. The position of EU citizens living here in the UK. And the position of UK citizens living in those 27 EU countries. The BBC host asked the Prime Minister one final time for a definitive answer on whether the UK would pay the Brexit divorce bill upfront. The Prime Minister backed down suggesting the EU would have to wait until the end of Brexit negotiations before they receive the UK’s divorce settlement. “And the EU itself has also said that nothing is agreed until everything is agreed,” Mrs May said. The EU is adamant it will not hold trade talks with the UK before it has received satisfactory guarantees on EU expatriate rights, the Ireland question and Britain’s “Brexit bill”. EU officials estimate the UK faces a £50billion bill under EU budget rules but UK politicians have said the Government will not pay the sum. Speaking after Saturday’s summit, Mrs Merkel refused to be drawn on numbers, saying: “No sum was discussed. We will have to talk to the British first, find out things such as what they will put in the coffers on research”. French president Hollande added that there would inevitably be “a price and a cost for the UK”. We are in a chaotic situation where everybody is running in different directions, and new threats are looming on the horizon every day. It is important that we keep our composure and concentrate on one thing at the time in order of their importance. Start at the trunk of the tree and work the branches,one by one and finally the leaves. We need another Turing to solve the EU enigma. Life is not about avoiding the storm but learning to dance in the rain!